Our AE-Series Collector frames are fabricated in our state-of-the-art manufacturing plant located in Jacksonville, Florida. Crafted using extruded baked polyester (MB-40) electrostatic bronze painted aluminum and securely fastened with aircraft grade pin grip rivets, AE-Series Collectors are built to withstand the most demanding environments. 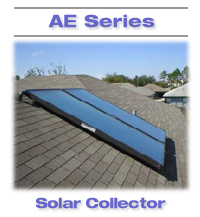 AET and its predecessors are based in the United States and have been manufacturing solar thermal collectors since 1975. Our new energy efficient Thermatool solid-state weld head has reduced the carbon footprint of manufacturing solar collectors by 25%. We are proud to provide collectors that are designed for 30+ years of dependable service and carry a full 10 year warranty. Our Crystal Clear™ selective coating is non-toxic and a more efficient electro-plating than other coating methods used in the solar industry. The AE-Series collector's quick-lock mounting hardware is integrated into the frame wall for easy collector installation and to add to its already attractive design. Delivery Information: Please allow 2 to 10 business days for orders to be processed, plus standard transportation delivery time.